• Phones that require a messaging plan at time of purchase include: Pantech Reveal, Pantech Impact, Motorola Karma, Samsung Flight, Samsung Impression, Samsung Magnet, Samsung Solstice, Samsung Mythic, Samsung Propel, LG Xenon, LG Neon, and the LG Vu. • It looks like the minimum monthly cost when buying a "Quick Messaging" phone is around $20. That's a $5 200 SMS/MMS plan and a $15/month unlimited data plan. It doesn't look like you can walk out of the door without paying less than $20/mo in features in addition to your voice plan. 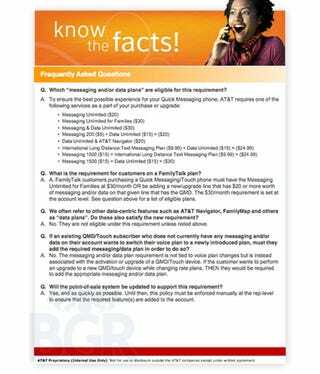 • There are slightly different requirements if you have a family plan, so check those out in detail with your AT&T liaison. • If you have an existing "Quick Messaging" device, you don't have to do a thing. But, if you want to ever upgrade to a new device, you'd then be hit with the messaging feature requirement. Not exactly the best news for those looking to keep their wireless bill pretty low (and straight forward). Catherine Zeta Jones, where you at? Thanks, to all our connects that broke this down for us!